Has worn-out caulk around the tile, tub, or sink left you—and your home—feeling exposed? 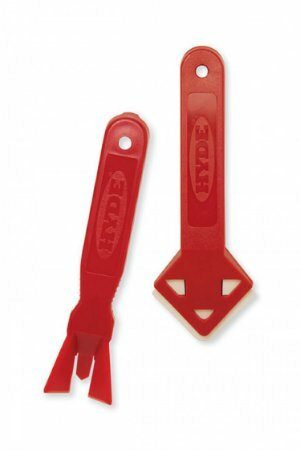 Remove and reapply caulk with ease using this dynamic duo from Hyde Tools! Whether you’re filling cracks along the kitchen sink or closing up gaps around a drafty window frame, you can count on caulk to seal the deal. But despite its prowess in shutting out air- and waterborne intruders, such as dust, mold, and mildew, the filler is also notoriously difficult to remove without leaving behind unsightly residue, and apply without creating messy lines. The next time you find yourself in this sticky situation, don’t waste time with those traditional caulk scrapers and finishing tools that can damage the underlying surface or leave you with less-than-perfect results. There is an easier way to achieve a clean finish, and it’ll set you back just 5 bucks. We’re talking about the Caulk-Away™ and Caulk-Rite™ tools from HYDE, sold together in one convenient package. One of the most important tenets of applying caulk is that new caulk does not adhere well to old caulk. This means it’s an absolute must to completely strip surfaces of old sealant before applying fresh caulk. In the past, you may have risked harming your tile, window frame, or countertop by chipping away at the old bead with traditional metal caulk scrapers, or filled your home with fumes from chemical caulk removers. The gentle, all-plastic Caulk-Away™ tool lets handy homeowners breathe easy. 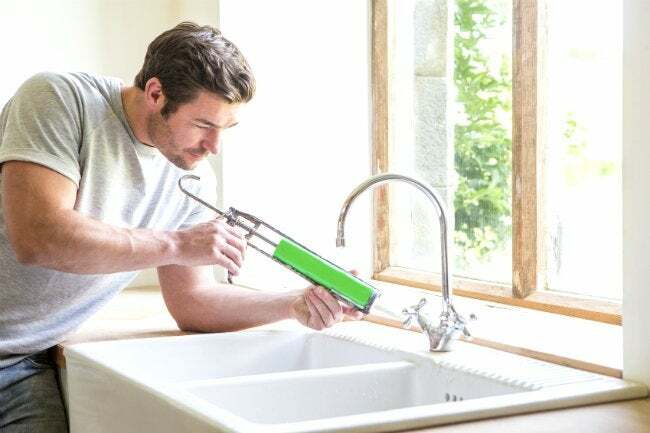 They can forgo chemical removers, instead accomplishing the job with a razor-sharp tool that will leave sensitive surfaces—even tile, marble, or glass—unscathed while still removing silicone, latex, or acrylic caulk with ease. Simply position the scraping hook of the Caulk-Away™ tool against the old caulk, and loosen it using a push-pull motion. Then, flip the tool around so that the central blade slips underneath the bead of caulk and cleanly lift off the sealant—no solvent required. The flexible wings flanking the blade let the tool act as a putty knife, allowing you to get at even hard-to-reach corners or grooves around tiles, fixtures, plumbing, and pipes as well as the caulking around showers, tubs, sinks, windows, doors, and other fixtures—both indoors and out. With your tub—and your hands—free of caulk and no worse for wear, you can recaulk surfaces in a jiffy too. First, apply silicone, latex, or acrylic caulk to the surface via a caulking gun or squeeze tube, just as you usually do, but then swap your old ways of smoothing with a spoon (or, even messier, your finger!) for a more precise method. The second component of this caulking kit, the Caulk-Rite™ application tool, rapidly creates an air- and watertight seal for you, without marring or contaminating the uncured caulk. Like its counterpart and unlike its metal-tipped competitors, the plastic Caulk-Rite™’ applicator won’t scrape the enamel from surrounding surfaces. By gently gliding the tip over the fresh bead, you’ll achieve a perfectly distributed bead of caulk without residue, edge marks, or splitting, and you won’t end up wasting time redoing your work. When you’ve wrapped up your professional-looking job, go ahead and clean up, free from worries that your freshly applied caulk will split or come loose—just be sure not to wash up in a sink you’ve just caulked until the sealant has cured!